The campaign is growing, to bin the disastrous Housing & Planning Act, and act to control rents and secure homes for all. Join us at Parliament 23 November from 12 noon. We will present our alternative Autumn statement for housing. 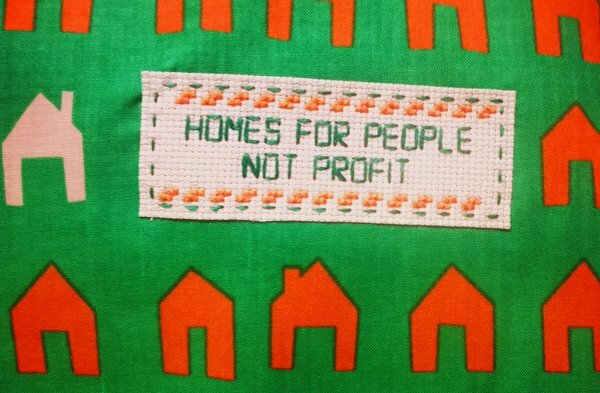 We’re calling on all tenants groups, housing campaigners, trade unions, councils and housing associations to join the campaign and work with tenants and trade unionists to resist and defeat the Housing Act. All are welcome to join the protest. 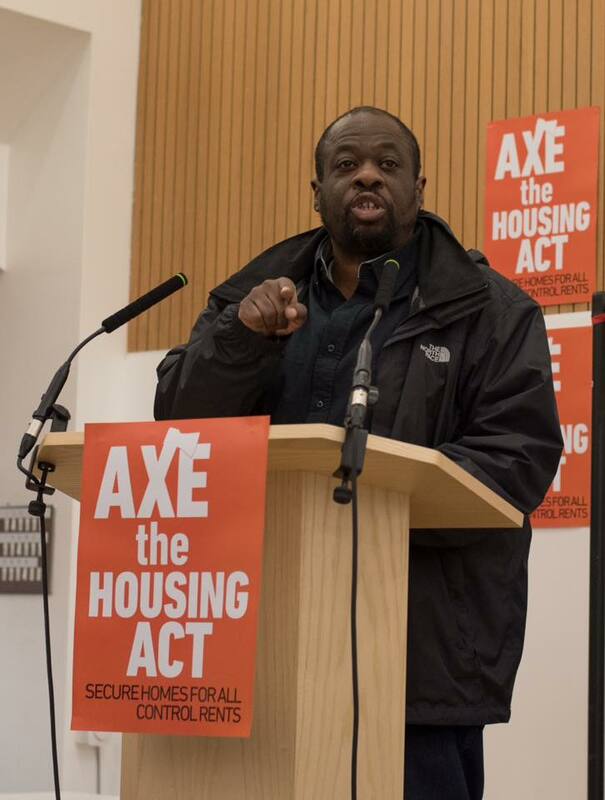 A selection of video testimonials from campaigners at the October 2016 Axe The Housing Act National Summit – with thoughts on the Housing and Planning Act, why it’s wrong and what we can all do to challenge it. Also featured are personal stories on the importance of social housing, the need for new, truly affordable homes and the current socio-economic landscape. 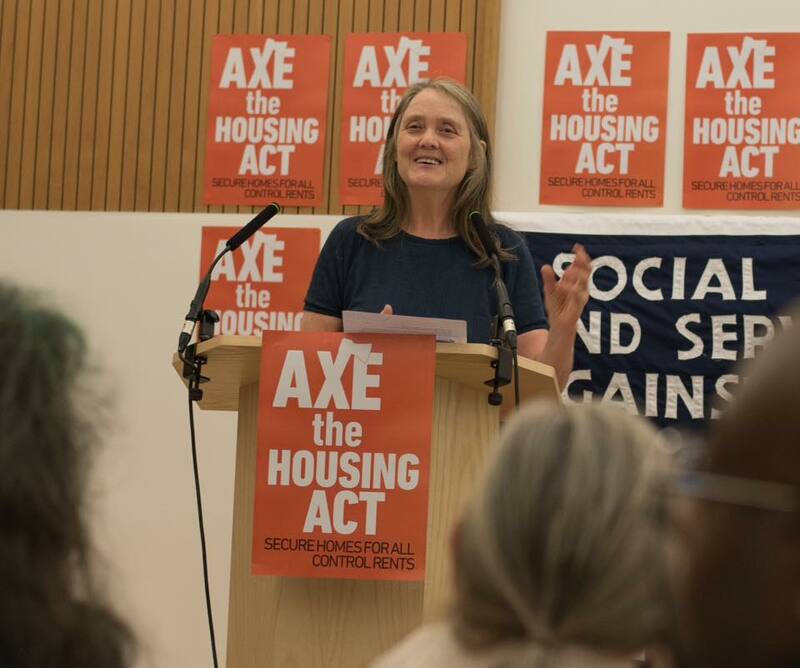 October 22nd’s Axe the Housing Act national summit at the National Union of Teachers HQ was a great success, 200+ people, from 30+ different council areas all determined to unite and fight the Tory attempt to turn back the housing clock. 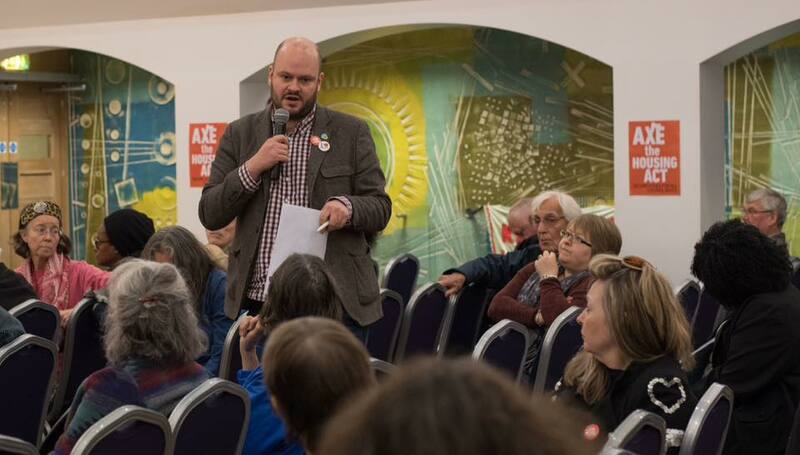 This broad and growing alliance was reflected in the attendance, with council, housing association, co-op and private tenants alongside unions and local councillors. Speakers included reps. from Disabled People Against Cuts, Stand Up to Racism, the British Assoc. of Social Workers, the successful Butterfields campaign and the elected mayor of Hackney. There was also a statement of support signed by 20+ bishops, the Muslim Council of Britain and other faith leaders. And read some of the great ideas and outcomes from our workshops on our resources page. A ringing call for a change in housing policy, welcomed a national summit meeting today. The 23 bishops and other Christian, Jewish, Muslim religious, led by the Bishop of Stepney, describe the Housing Act as “damaging, divisive and unworkable legislation”, and ‘urge the Government to think again’. The letter was sent to all attending a packed meeting of tenants, unions and councils opposing the Act. The controversial legislation was passed in May this year after serious resistance in the Lords. It now depends on secondary regulation, none of which has been published or adopted. The Act threatens wide-ranging changes to existing and future housing provision – see campaign briefing and detailed planning briefing. Opposition is growing, from Chartered Institute of Housing, and the Local Government Association representing councils across England. Labour conference adopted policy against the Act last month. The Housing Act summit brought together more than 220 from 30+ areas over half from outside London. 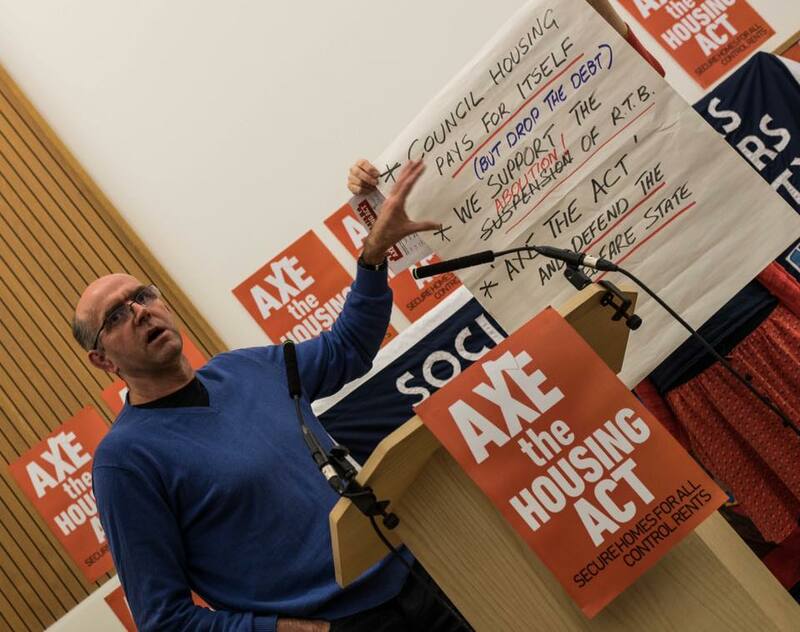 Planned resistance to the Act includes demands on councils and housing associations not to implement a ‘tenants’ tax’, right to buy and market sale of ‘higher value’ council homes. 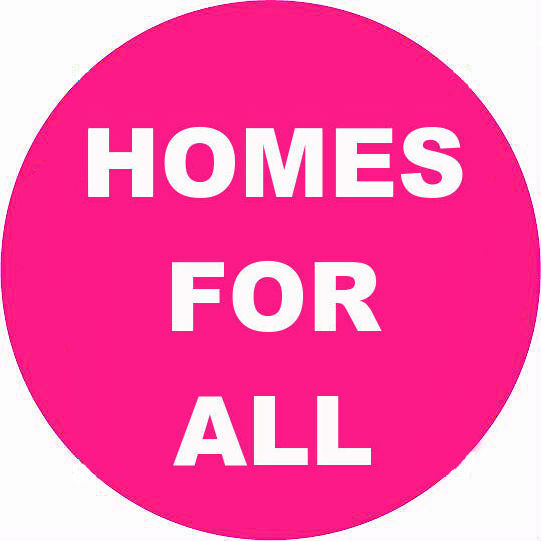 A plan of campaign includes a protest at Parliament 23 November demanding action on housing in the Government’s Budget Statement. 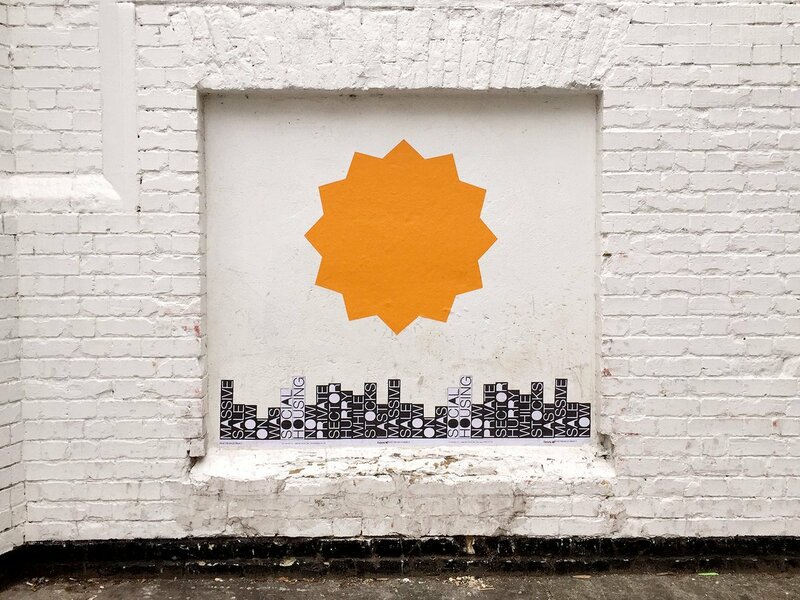 The Housing and Planning Act may be well intended, but desperately needs re-thinking; as currently conceived it is a piece of damaging, divisive and unworkable legislation, which far from improving things is actually set to make the housing crisis worse. Warnings about unintended consequences are being sounded by well-respected organisations like the Chartered Institute of Housing, Shelter, and the Local Government Association. Housing is fundamental to our dignity and identity as human beings, and a fair and transparent housing policy underpins the flourishing of all communities; yet the current policy threatens to undermine our attempts to create a socially-cohesive society where the needs of the most economically vulnerable are afforded a special place. We need a Housing Act that meets the needs of millions, not only the few, and offers a genuinely sustainable alternative to the endemic uncertainty of the housing market. The Prime Minister has said she is committed to leading a government for the many, not the few. The Housing Act stands in contradiction to this and we urge the Government to think again. 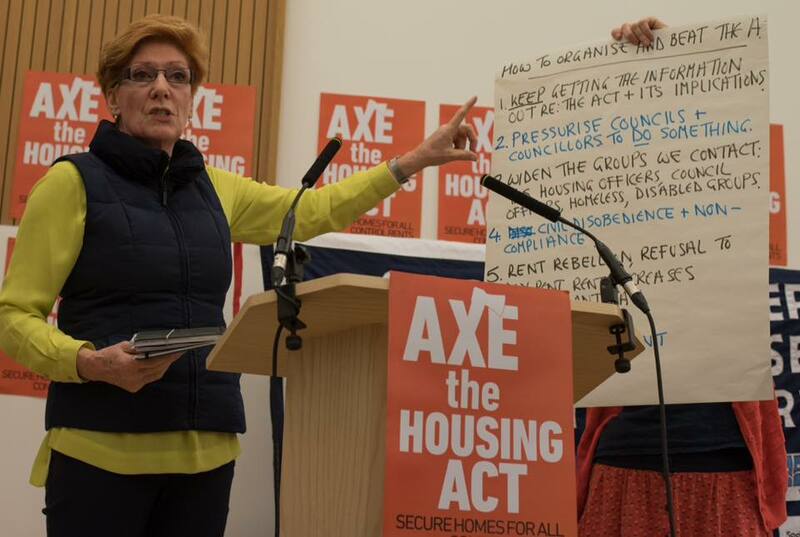 Axe The Housing Act will be holding our first national summit on October 22nd in London. 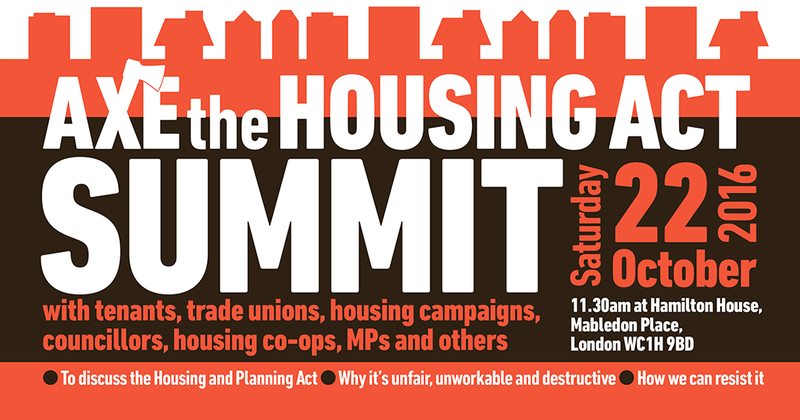 The Summit will be a day of discussions, workshops, panels and plan making for future actions against the implementation of the Housing Act. Do you have a housing story to share? Are you a campaigner looking for support with your action? Do you need more information about the Housing Act and how it will affect you? Come to the summit and let’s discuss the issues at hand and what we can all do together to stop this Act in it’s tracks. 11.40 The Housing & Planning Act – Panel. Why it’s wrong and what we can do. With key note speakers and guests. – Housing Associations – how will the act hit and what can we do? – Young people, private renters and the struggle for homes. 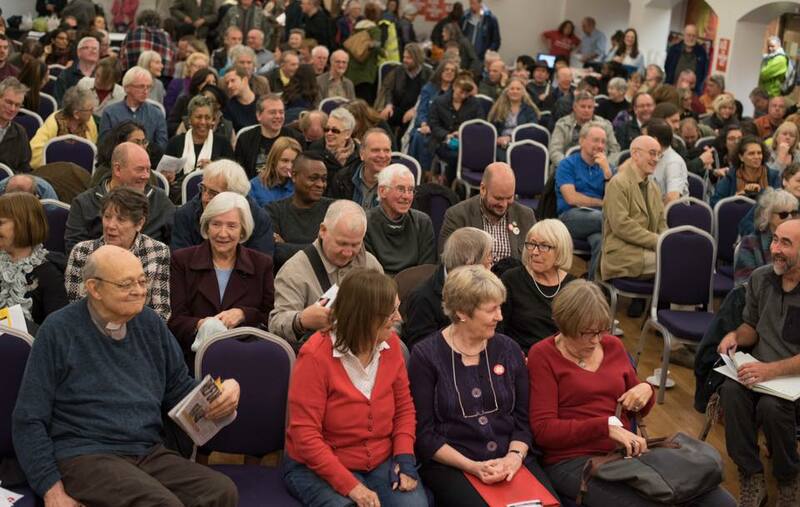 The Summit will also be hosting stalls from Unite Community, Crime and Justice Network, Unite the Resistance, Stand Up to Racism, Defend Council Housing and more. “As someone who was born into social housing, I have always seen it as respectable accommodation for respectable people, not an investment opportunity wasted on people so feckless as to have born without family money. 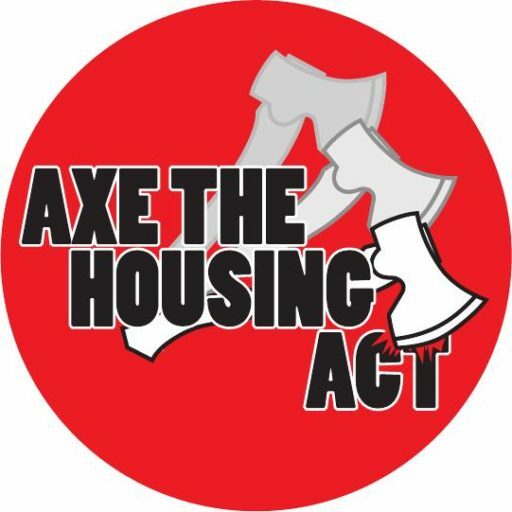 Join Axe The Housing Act and other housing campaigners at this Sundays march at the Conservative Party Conference with the Peoples Assembly. 11.30 a.m Victoria Square, Birmingham.